Hi I’m New Here – Help me Find a CBH Home! Hello! Is this your first time buying a home? If you’re a rookie, you’ve come to the right place. We are here to help and get you started on the first step! Let’s get you headed in the right direction! Oh, and we’re just a call, text, or email away to help if this is all just a little *too much*. And considering CBH Homes in your new home search! We’re really excited to tell you that after you read this, you will probably just call up the sales team nearest to you and and do the dang thing. Ahh, what a feeling. We’ve been around the block, a couple times! CBH has been around and kickin’ for 26 years to be exact. What does that mean? We’ve made mistakes, and learned from them. We’re experienced and you can trust that we’re not going anywhere. We’ve been through the ups and downs! Our building process is top notch. We tweak, fix, and have made things better over the years. Did you know that we have 4 sister companies? From interior selections, trusses, HVAC to electrical. These teams are right there with us, ready to change, help, and update our options so we can be new, fresh, and up to date with the trends. We are constantly wanting to get better, and we’re pretty darn knowledgeable about what we’re doing. CBH Homes is proud to say we have over 18,000 happy homeowners and counting. Wahoo! CBH Homes is the #1 Home Builder in Idaho for a reason. We have more selections and locations than any other home builder in the Valley. We have move in ready homes in Boise, Meridian, Kuna, Caldwell, Nampa, Star, Eagle, Middleton, and even Mountain Home & Twin Falls. Whatever you want and need, we flat out have it, and we really are here to help you find that perfect home. Okay, now you know a little bit about us, do I still have your attention? Lets check out our website really quick! Check us out at www.cbhhomes.com. This step is easy, I believe in you! It will take you to our home page. Feel free to dig deep. Once you’ve explored, head back to the home page and click FIND A HOME – see below highlighted in yellow. You can then search for a home in a specific area, or view all homes, whichever you prefer. Explore some more and research your favorite areas! Do you know where you want to live? Click around, find that perfect area close to a good school for your kids, by the freeway for your morning commute to work, near the village in Meridian for date nights out, or out in the country in Kuna or Nampa. We have homes EVERYWHERE, it’s pretty much impossible for us not to find you your dream home. 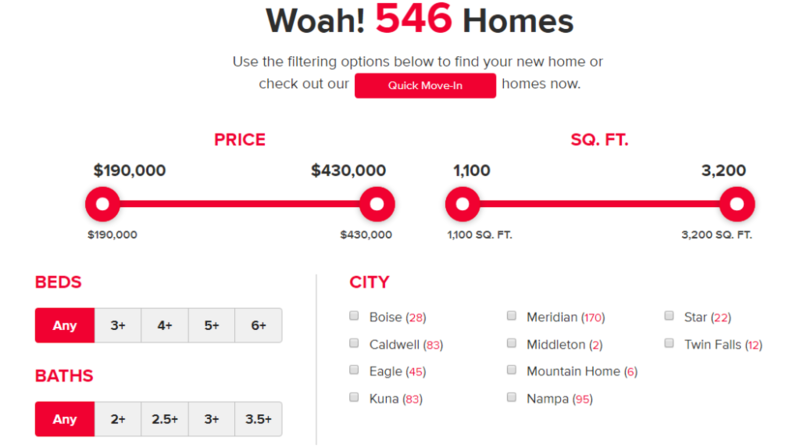 We have these AMAZING filtering options to really help you get the specifics in your dream home. Change the price range, square footage, and town. Furthermore, you can scroll down to get into the specifics of amenities such as walk-in closets and hardwood floors. Let’s get down to the nitty gritty and make this an easy, slam dunk choice! Familiarize yourself with some of our floorplans! We know, 41 floorplans might seem a little overwhelming, but you’ll get a good feel of what style you’re looking for, and if you need more help, our sales team are PROfessionals and can help you narrow it down and even show you some of your favorites! How are you feeling? Do you have all of the information you need or are you wanting more? Even if you don’t, you can certainly call up our new home matchmakers NOW! Especially since we have our Up to $10k* promo going on until December 31st! Not a fan of phone calls? You can also shoot them a text! p.s- they are real people and SOOO nice and helpful! Not a fan of texting either? Fill out a general question form HERE and someone from our team will contact you. Thanks for reading, we hope this helped! Don’t forget to check us out on our social media below!!! Stay tuned for next week’s blog post. We’ll update you on the next steps after you’re familar with CBH Homes and our locations! Previous PostOur CBH Dog Calendar is Finally Here! Woof!